A Nigerian philanthropist and former Aba North Chairman, Alex Ikwechegh has visited Abia woman whose fingers were cut by Fulani herdsmen. Miss Esther Nmecha, who needed N60,000 for treatment, had solicited for help from Nigerians. To her greatest surprise, Alex Ikwechegh through his foundation visited her and donated a huge amount of money and offered a job to her in order to take care of her personal needs. Speaking on behalf of Ikwechegh, the spokesman of the foundation said he was dejected when he heard the dastardly act being committed by the rampaging Fulani Herdsmen in Abia State and asked security agents to arrest the perpetrators of the ugly act. 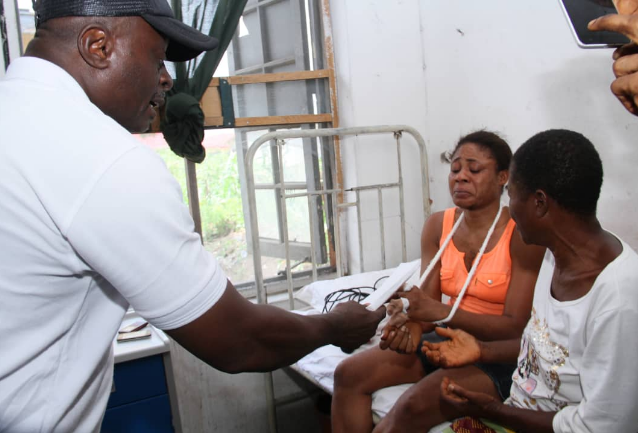 Igbere TV reports that Ikwechegh also paid hospital bills of other patients in the hospital. In his words, "We are here because our Chairman, Alex Ikwechegh understands your plight. In fact, he was dejected and devastated when he heard the news and that's why he sent us to donate this money to you ". "This is not Abia State that we use to know before. We had peace but now with the coming of the Herdsmen, our people now live in fear which ought not to be so. "We want peace in our state and hopefully, the security agents will act immediately to stop the nefarious activities of the Herdsmen, " he said. 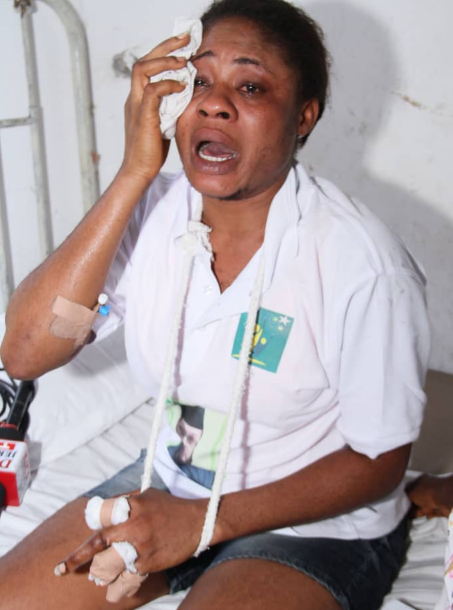 Narrating her ordeal, the woman said trouble started around 4pm on the fateful day when herdsmen encroached on her business premises along Peoples Road, Ogbor Hill, Aba. She said an appeal to the invaders to leave the premises fell on deaf ears as they threatened to kill her. Nmecha said, “In making real their threat, one of the Fulani herdsmen brought out his machete and targeted to cut my neck. It was in an attempt to defend myself that he missed his target and cut off my four fingers. “I was rushed to the Police Clinic at the Central Police Station, Aba, where they immediately referred me to the Aba General Hospital as a result of the critical nature of my case... I thank Ikwechegh for coming to my aid, may God bless him abundantly ".